uuid : f802818b-ec6e-4d5b-8b39-71ed8ce5901f templates_id: 119622 templates_uuid: "a6bb4b54-dd33-45ea-979b-98b7ba2b1a73" title: "Service Contract - Service Agreement - Service Contract Template" display_name: "Services agreement" meta_keywords: "General contract for services, Services contract and Contract for services " description: "
Make sure you do things right when you prepare\302\240your service contract. This service agreement form\302\240sets out in clear and simple terms the process to be followed\302\240for the provision of services between two businesses. A services agreement is an agreement between two parties (customer and supplier) for the supply of services. It sets out the agreed terms between both parties for the provision of services. Terms include: details of the services to be provided; payment; how liability is to be limited and ownership of intellectual property created under this agreement. Do I need a services agreement? A services agreement is needed when a business wants to engage another business\302\222s services. Creating a services agreement will ensure that both parties understand their obligations and protect the positions of both businesses in case of termination, or legal dispute. What is a service level agreement and do I need to attach one as a schedule to this agreement? A service level agreement (SLA) is a separate contract between a supplier and customer within a services agreement. It defines the level of service expected from the service provider such as the volume and quality of work, speed and efficiency. The purpose of having such document is to establish mutual understanding of the level of services to be provided. A service level agreement is not the same thing as a services agreement. In this agreement, you can choose to attach a service level agreement as a schedule, or describe the details and description of the services in the contract. Service level agreements tend to be unique to the situation. If you need help creating one Ask a lawyer. What is the difference between a services agreement and service level agreement? Service agreements are long term agreements with the business partners, saying certain services will be offered to them in a defined validity period. A service level agreement (SLA) would focus on the performance measuring and service quality agreed to by both parties, and may be used as a measurement tool as part of the services agreement. It\'s best to have a separate SLA document because you can revise the SLA without having to revise the services agreement. The contract can just refer to the agreed SLA. The contract might then last for 2 years but the SLA may be reviewed quarterly, for example. This reduces the administrative burden of reviewing the contract too frequently. What are the customer\302\222s obligations in this agreement? In this agreement the customer is under obligation to cooperate with the supplier of services in all matters. These include providing equipment and materials where applicable & obtaining necessary planning permissions before services begin. The customer must ensure that the supplier and its casual workers or consultants have access to the premises and facilities when required. The customer must also ensure that the suppliers know the health and safety rules and regulations that apply at the premises or where the services are provided. How are the expenses of supplier agreed? You can specify the maximum amount that the supplier can spend in connection with the services without written consent under this agreement. \r\nAny expenses over the agreed limit have to be pre-approved by the customer in writing. Does the customer need to provide a deposit before the supplier begins providing the service? The customer does not need to provide a deposit before the supplier begins providing the service. In this document, it\302\222s optional, and if you decide to request a deposit from customer, you can specify the amount of deposit. Can either party make changes to the services rate? You can choose to allow the parties to make changes to the rates. Any changes require notice, and there is a minimum time in which the rates cannot be changed and a cap on how much they can be increased. The parties may wish to provide for over-time and also for pro-rata days and attach these details to the Charges schedule in this agreement. Can both supplier and customer limit their liability in this service agreement? Both supplier and customer can limit their liability. However, the limit will reflect the sorts of services which are being supplied, the potential to cause loss and damage and what is common in the relevant marketplace. It must be reasonable to be enforceable. This document allows you to specify the maximum liability of the supplier and the customer for each other\302\222s business losses. What do I put for \'Specification of services\' or \'Charges\' in the schedules? Customer\302\222s expectations of the quality, performance and value of the services to be provided. Agreement between the customer and supplier for providing a range and target level of services. This Schedule should contain information relating to the price of the services, which may include either one or more fixed prices, or a mechanism that will be used to determine the price. It may also include details such as whether VAT is included, and whether additional expenses are payable (and any related protocols). This services agreement is governed by the laws of England and Wales.
" created_timestamp: "2018-10-12 04:53:15.0" modified_timestamp: "2018-10-12 04:53:15.0" active: true created_by: 236 modified_by: 236 dcm_id: 308 url_slug: "Services-agreement" meta_description: "Create a service agreement in few minutes using this service contract template and simple guidance from Rocket Lawyer. Set out in clearly the terms for the provision of services. " time_to_complete: "20 minutes"
Make sure you do things right when you prepare your service contract. This service agreement form sets out in clear and simple terms the process to be followed for the provision of services between two businesses. A services agreement is needed when a business wants to engage another businesss services. Creating a services agreement will ensure that both parties understand their obligations and protect the positions of both businesses in case of termination, or legal dispute. A service level agreement (SLA) would focus on the performance measuring and service quality agreed to by both parties, and may be used as a measurement tool as part of the services agreement. It's best to have a separate SLA document because you can revise the SLA without having to revise the services agreement. The contract can just refer to the agreed SLA. The contract might then last for 2 years but the SLA may be reviewed quarterly, for example. This reduces the administrative burden of reviewing the contract too frequently. What are the customers obligations in this agreement? You can specify the maximum amount that the supplier can spend in connection with the services without written consent under this agreement. Any expenses over the agreed limit have to be pre-approved by the customer in writing. The customer does not need to provide a deposit before the supplier begins providing the service. In this document, its optional, and if you decide to request a deposit from customer, you can specify the amount of deposit. This document allows you to specify the maximum liability of the supplier and the customer for each others business losses. What do I put for 'Specification of services' or 'Charges' in the schedules? Customers expectations of the quality, performance and value of the services to be provided. More than just a Services agreement template, our step-by-step interview and guidance makes it easy to create your document. Easily create online, download, print and sign your free Services agreement in minutes. 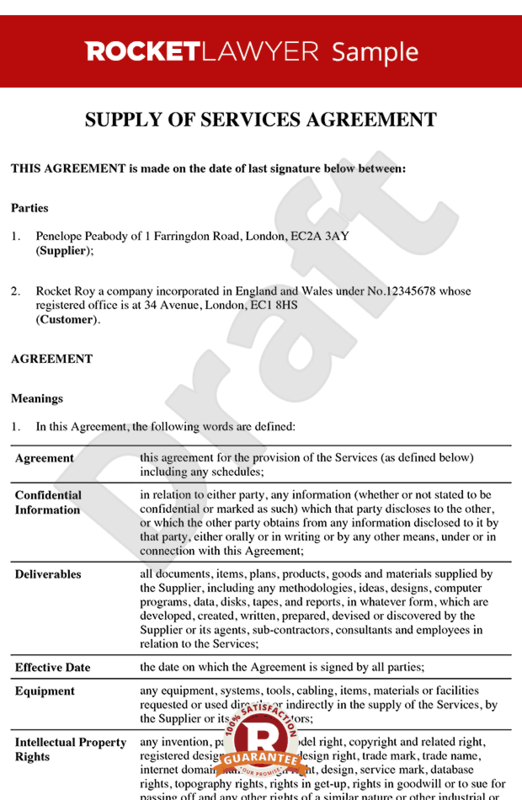 This document is also sometimes called: General contract for services, Services contract and Contract for services .